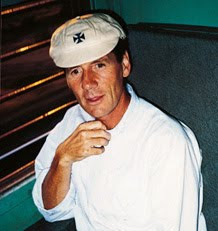 British actor and comedian Michael Palin wearing his father's old rowing cap in the popular series Around the World in 80 Days - see also HTBS 24 August, 2009. Dear Bob - The caps that you refer to have no special name that I know of. They are often called ‘cricket caps’ in Britain as this is the last remaining sport in which they are in common use (though the baseball style cap is slowly taking over). In fact, the ‘cricket cap’ and also the ‘cricket jumper’ (called the ‘tennis sweater’ in the United States) were in common use from late Victorian times until the Second World War in many sports: cricket, rowing, soccer, rugby. Fancy embodied ‘honours caps’ were given to men chosen to represent their school, club or country and we still refer to the number of times a soccer or rugby player has played for England, Ireland, Scotland or Wales as the number of times they have been ‘capped’. Less fancy (though still colourful) caps were for everyday sporting use. I suppose the cricketers kept their caps the longest as cricket was the only sport where it was practical and indeed sometimes necessary to wear headgear while playing - like baseball. 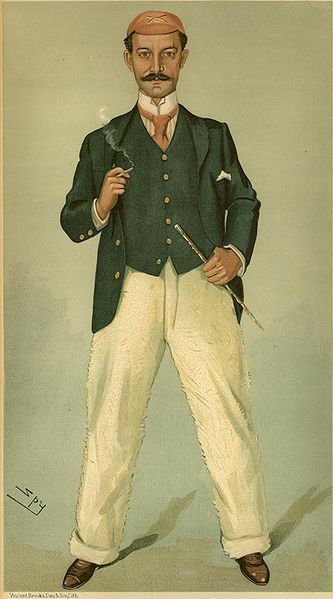 Until the 1960s they were a common part of the school uniform for boys from both private and state schools so they are sometimes also called ‘schoolboy caps. I wore one myself. Famous rowing coach and writer, Rudie Lehmann is wearing his Leander cap in this drawing by SPY. The five most famous rowing club caps still available (to members) are those of: Leander Club; Thames RC; London RC; Cambridge University Boat Club; and Oxford University Boat Club. My club, Auriol Kensington, no longer has such caps. I have the only one in existence; you might have seen it in my video of Henley on HTBS (at 1 min 30 sec). Everything you could wish to know on the subject is here. As they are made of wool, they can be rather warm but, as you are in Washington State, that may not be a problem for much of the year. Postscript: Although, we did not have caps like these in the Swedish schools, I did have to wear one when I for a short time had joined a Scout group in town. I also received an old German 'rowing cap' from the late 1940s, early 1950s from an old member of my Swedish rowing club. It looks a little different from the English rowing caps and is made of cotton, not wool. - G.R.B. Today is the day that the US National Rowing Team begins racing at the 2011 FISA World Rowing Championships in Bled, Slovenia. Over the next seven days 84 athletes will compete in 26 events for the USA! This year the World Championships is also the first Qualification Regatta for the 2012 Olympic Games in London, and our team will be racing to qualify 14 boats for the Olympic Regatta that begins in 334 days, on July 28, 2012. The US Team is ready to race! If you want a behind the scenes look in Bled during the World Championships, go to our website at www.natrowing.org and follow the links to the National Rowing Foundation Facebook page, Twitter account, and YouTube page. These links will give you a unique perspective of what is happening with our US Team. Our team needs relies on the support of all of us to keep our US National Rowing Team successful. Please consider making a donation to help the US Team today. ...in our 45th year of supporting athletes in pursuit of excellence! Dear readers and fans of this blog! HTBS is back! The power came back 40 minutes ago after Hurricane Irene took down the power lines on Sunday morning. The previous post, on Sunday, was actually written on Saturday morning before I was getting ready to meet Irene when she was to hit the Connecticut shoreline on Sunday morning. I sent Mrs B. and our children up to Maine to Mrs. B's mother, while I was going to ride out the storm in our house, like a good sea captain tying myself to the bookshelf that holds my rowing books. It did not work out that way. On Saturday afternoon, the town called for a mandatory evacuation of us living close to the Mystic River. I waited as long as I could - to the stage when the town police started to knock on my neighbours' doors to have us all to leave. I headed for the 'Community Hilton', the high school in town, where the Red Cross had organised a shelter, a safe haven with food and a cot for each and everyone in a couple of the corridors of the school. The Red Cross staff did a great job and to be useful I helped out with unpacking the cots and putting them together for those who was too sick and old to do it themselves. 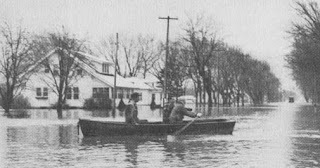 After Irene had passed and the roads were cleared from trees and power poles, which had fallen over the roads and streets, making the town impossible to travel, I drove home to the house on Sunday afternoon. Luckily the house was still standing, and no water in the basement! Some big branches from an old tree in the garden had fallen down, but not hitting the house. Of course, the power was still out, as was it for almost the whole entire eastern Connecticut. But now the power is back & all is well - HTBS is back! 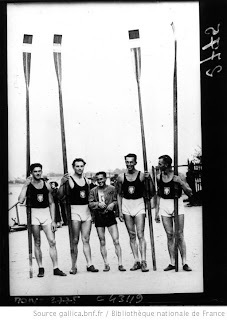 The always reliable Tim Koch has found an interesting newsreel on British Pathe regarding yesterday’s HBTS entry on women’s style rowing in Germany. While the German women were competing in this discipline for the first time at a regatta in 1919, the British women followed soon thereafter, according to the 1926 newsreel “Oars-woman-ship. Reading girls gain narrow victory over Oxford girls - by 8 points - in first competition for style in women’s fours”. If you have more information on ‘style rowing’ please send HTBS an e-mail. The 1951 and 1952 German champions in style rowing: Ruth Roloff, Rosemarie Bick, Lore Häger, Hanna Müller and coxswain Elvira Lasarewitz of PSV Bremen. A little footnote to the HTBS entry Rowing Skills & Rowing Relay Races on 23 August could be another relatively unknown rowing discipline, ‘Style Rowing for Women’, or, ‘Stilrudern für Frauen’ as it was called in Germany, which seems to be one of the few countries where these unusual rowing competitions were held on a regular basis. 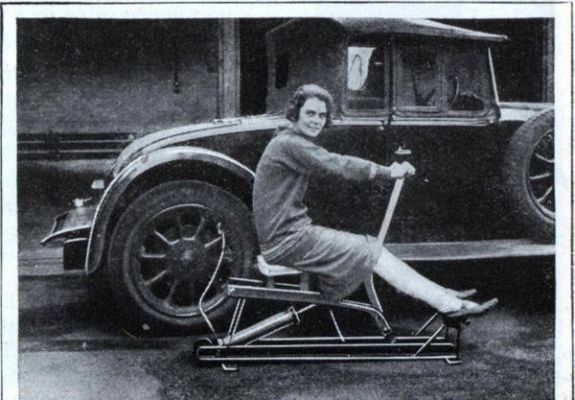 According to the German Rowing Association’s website the first style rowing regatta for women was held in 1919. There was even a national championship for women in coxed quadruple sculls in Germany between 1937 and 1969 (during 1951-1969 in the DDR, East-Germany; see the bottom for links with the names of the champions and their clubs). More than fifteen years ago, when I was still living in Sweden, I wrote a very short piece about style rowing, and, if I remember it correctly, the course was something around 335 metres – odd distance, I know – and the umpires would check the crews’ style during their row down the course, meaning their technique, esthetic ‘Eleganz’, choreography, togetherness, etc. The crews would start with a certain amount of points, which would be deducted along the way depending on lack of the elements mentioned above, or mistakes made during their row. 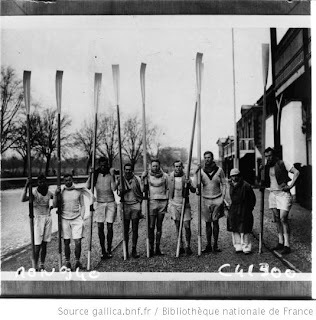 Anyone who knows more about this, in our time, ‘odd’ rowing discipline is more than welcome to contact HTBS, and I will post the information on this blog. The 1962 DDR champions Helga Schmidt, Ingrid Fischer, Antje Thieß, Renate Boesler, and coxswain Ursula Bader of TSC Oberschöneweide. The two photographs in this entry are from the website of Rüsselsheimer Ruder-Klub 08 e. V., and it was also there I found the following two links with lists of the German champions in 'Doppelvierer mit Steuerfrau, Stilrudern - Frauen, 1937-1955' and 'DDR-Doppelvierer mit Steuerfrau, Stilrudern - Frauen, 1951-1969'. 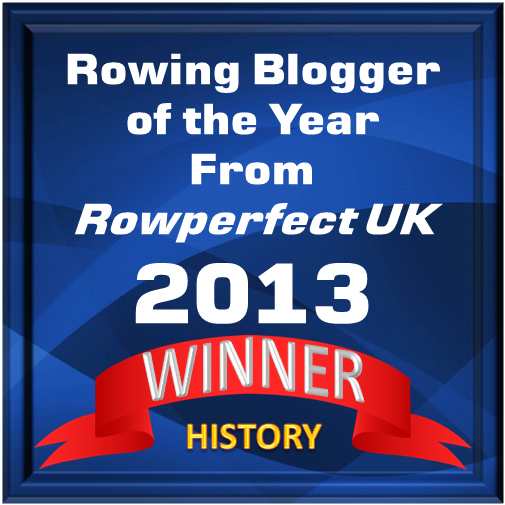 Here is a funny thing I first saw on Chris P.'s eminent blog, Rowing for Pleasure. Not even at the airport in Munich, on their way to the 2011 World Championships in Bled, Sovenia, did Great Britain’s heavy men’s eight get some rest. Practice, practice…. The video is featuring Phelan Hill, Dan Richie, Tom Ransley, Greg Searle, Moe Sbihi, Alex Partridge, James Foad, Cam Nichol, Nathaniel Reilly-O’Donnell, and Marcus Bateman. Video done with some help from Pete Reed. You can follow the team via Nathaniel Reilly-O’Donnell’s blog. This video was also shown on The Daily Telegraph’s website and on The Sun's website. My father didn’t deliberately coin aphorisms. He was far too modest a man to think that anyone would be writing down his profundities. I do remember him saying some very good things like “Any idiot can win.” That’s always stayed with me. What he meant was “Winning doesn’t actually teach you anything.” You win. End of story. But the losing and how you deal with it and what you take from it - that’s the interesting bit. The whole thing about rowing is that you’re facing the wrong way. If you fall behind, you can’t see who’s winning. That starts to mess with your head: how you keep in contact until you push for the finish line. My father and I were discussing these very strategic pushes and he said: “Well, you could do all that, but I remember when I rowed, we’d just have one push. You put everything into that one push, and if it doesn’t work, well, we all lose some races.” The funny thing about it was, he never did lose any races. He won everything. But I thought it was a wonderful way of looking at life: You have one big push. Put everything you’ve got into it. If it doesn’t work, well, we all lose some races. If you’re trying to hold back, if you don’t commit, you’re never going to get results. Clever man, that Laurie Senior…. The article goes on by saying that the competition had twenty-five young rowers sculling in single sculls, double sculls, and quadruple sculls showing boatmanship as they had to row forward, backward, stop, turn around a buoy, etc. The manager of the Laval Rowing Club, Mr. Daniel Aucoin, is saying that this form of competition is “better known in Europe”, which is news to me, but I have to agree that it’s a great way for children and youths to learn boating skills. Read the article by clicking here. So how is it done? It seems the crews row 50 metres to a buoy, turn 180 degrees, back up to another buoy to touch it with their boat’s stern. Then they race 50 metres, turn 180 degrees and row slalom between some coloured buoys, turn 180 degrees again, and row 50 metres with square oar blades. To read more about Laval R.C. click here. Talking about other rowing competitions for children: when I was the regatta secretary at the Hjelmsjön Regatta, in the south of Sweden, we ended the regatta with a relay race for juniors in single sculls. Three teams/clubs would compete against each other at the same time, each team using two lanes, every junior sculling 100 metres. You start the three teams’ scullers 100 metres from the finish line so they race toward the finish line. At the finish line, their three team mates are waiting for them to cross the line, so that they can scull their 100 metres toward the start. When they pass the 100-metre-mark, the third member of their team will scull towards the finish line. Of course, older juniors can row longer distances, and in any boat type. It was much appreciated by the young rowers, their coaches, families and friends, and the other spectators, who saw the whole 3x100-metre race by standing at the finish line. Rowing Skill Events and Rowing Relay Races - there are a lot of fun things for children to do at a regatta! It is up to the regatta organisers to make it happen! A couple of nice commemorative oar blades were posted on British eBay earlier today: St. Peter’s Hall, Oxford, and Thames Rowing Club. The St. Peter’s blade is from 1949, and the Thames R.C.’s blade is from 1951 from a victory in the Stewards’ Challenge Cup at Henley Royal Regatta. The Thames crew was J.P. Dizer (bow); A.J.R. Purssell; H.W. Rushmere; and P.C. Kirkpatrick (stroke). In the final the Thames beat a crew from Leander Club with 1 ½ length, at 7 min. 53 sec. Starting bid is £49.95, and the action ends on 31 August. I think the blades look quite lovely. Although, the blades look to be in outstanding condition, I will pass this time. Please observe that there is a misprint in the seller’s description, the Thames blade is said to be from 1952 (when actually Thames R.C. also won the Stewards’, but not with the same crew), but it’s from 1951. 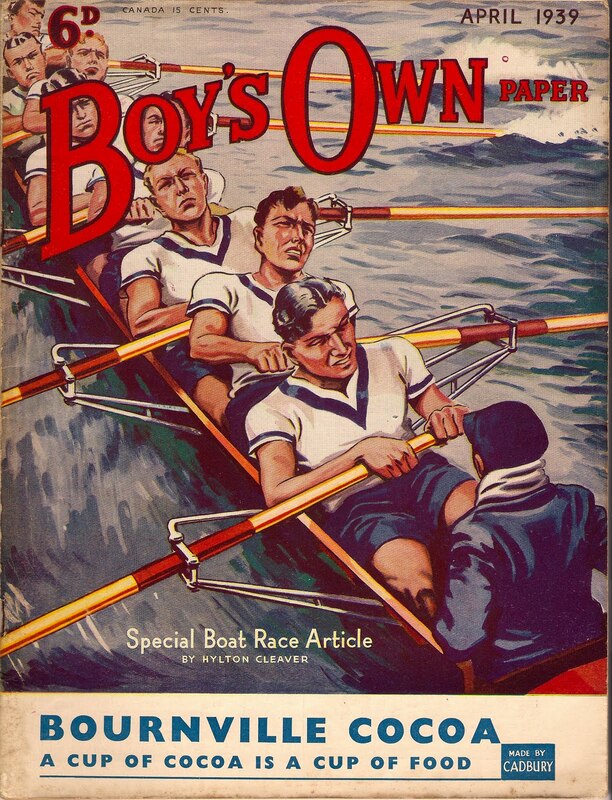 HTBS has often use newsreels from British Pathé, which actually was founded as Société Pathé Frères in Paris in the 1890s, to show old crews of Oxford and Cambridge practicing or racing, and when the professional scullers were battling for a championship, and sometimes an oddity like girls rowing on a roof top or London RC doing their 'jazz rowing'. 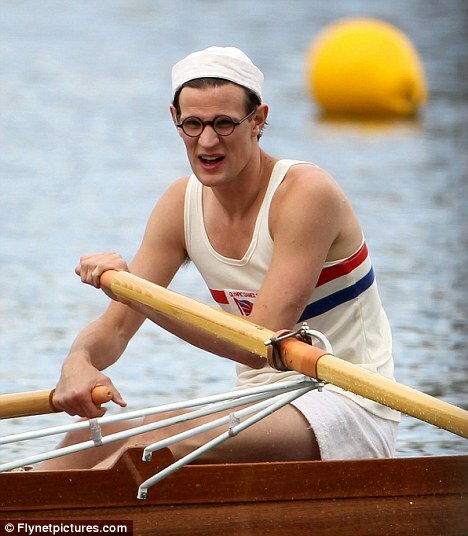 Whether you are a rower or not, British Pathé's treasure trove has something for everyone. Right now BBC Four is showing a documentary series about the company, The Story of British Pathé. The first programme was shown on 18 August, "The Birth of the News", and three more programmes are to follow. Read more about the series here. (Unfortunately, the iPlayer do not allow viewer outside Britain - or maybe outside of Europe - to watch). To read The Daily Telegraph's review of the first programme, please click here. Of course, now I have to show a couple of newsreels. I have picked two which show the same rowing 'oddity' (but it is still rowing! ), gondolas, which has two 'celebrety' gondolier, Ernest Barry (in 1921) and Humphrey Bogart (in 1951)! We read about and watch the top-notch athletes who are rowing at the World Championships and at the Olympics. They win medals and we are happy for their success, they lose, and we feel sorry for them, maybe thinking about all those years of hard work that left them without something to show for it. Well, at least, they can tell their children and grandchildren that they competed at the Worlds or the Olympics. Maybe they were not the best of the best, but at least they raced against the best. Now, how about those who almost made it to these Championships, the rowers who probably train and practice as hard as the rest of the National Team, but still end up ‘an alternate’? Sarah Megan Thomas (seen above) is soon going to show us. She has written a film script, raised the money to shoot it, and is right now filming it in and around Philadelphia, with the beautiful Boathouse Row as a backdrop. She is also staring in the lead role, Abi. Thomas’s film Backwards is the story about Abi, who has spent eight years of her life to reach her dream to row in the Olympics. 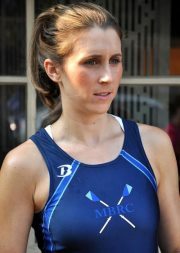 Twice she has been named ‘an alternate’, and now she is a high school rowing coach, working for her ex-boyfriend…..
Thomas, who is a rower, got the idea for Backwards from her rowing coach in college who left Williams College to train for the 2000 Olympics, only to be named the spare. 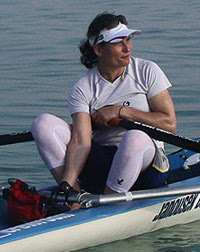 In an article on the Philadelphia blog Uwishunu.com, Thomas said, “Philadelphia is a major rowing city. I think the film captures the beauty of the sport and the city.” She has managed to gather quite a nice crew for this film. Read the whole article here. HTBS wishes Thomas luck with her film! On 20 July, I wrote about Ducker McLean's pamphlet Oarsmanship, which thanks to good detective work by HTBS reader Malcolm Cook could be nailed down to The Encyclopaedia of Sport which was published in 1898. 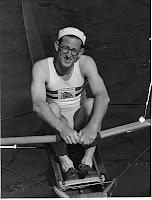 The following day, 21 July, HTBS's Tim Koch posted an interesting piece about rowing pamphlets. Technically, I believe that McLean's Oarsmanship is not a pamphlet per se, but instead a so called offprint, which is 'a separately printed article that originally appeared in a larger publication'. Nowadays, printed offprints are rare in the publishing business, instead you can probably read them on the web! In my little collection of rowing books I have an offprint in Swedish about the sport of rowing. A famous encyclopedia in Sweden is Nordisk Familjebok, which first edition was published in 1876-1899, which was followed by a couple of more editions. During 1937 and 1949, a beautiful 7-volume (4,000 pages) sports encyclopedia was published by Nordisk Familjebok. 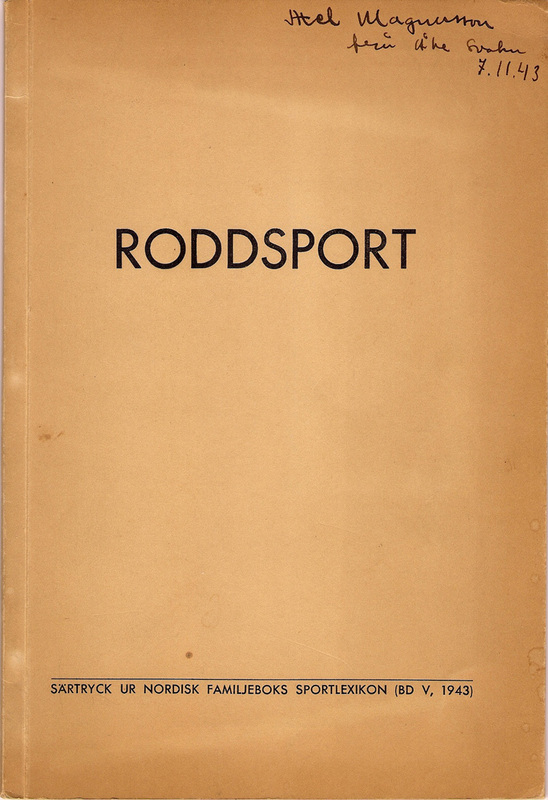 The section about rowing, which was written by head editor of the encylopedia, Åke Svahn, and published in 1943. The offprint, Roddsport, is 40-page long article with very nice illustrations in black/white (remember this is during the 1940; and I am also a little surprised that the publishing company managed to get hold of that much paper to print this during World War II!). Not surprisingly, Åke Svahn was deeply involved with rowing in Sweden. A year later, in 1944, when the Swedish Rowing Association celebrated the Association's first 40 years - it took the Swedish oarsmen a long time to get organised - Svahn together with Sten Thunvik published a brilliant work on rowing in Sweden, which actually goes beyond the history of rowing in Sweden. It is a pity that En Bok Om Rodd [A Book On Rowing] is written in a minor language, otherwise it would be regarded as a major work in the literature on rowing. The easiest way to try to explain its greatness is to call the book a Swedish version of Chris Dodd's The Story of World Rowing. More entries on rowing pamphlets will follow. 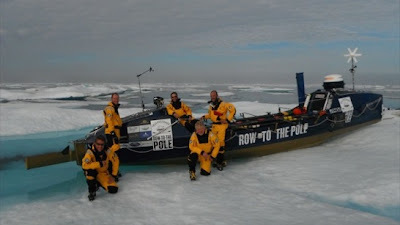 Jock Wishart, who is an Artic adventurer and transatlantic rower, is right now leading the “Old Pulteney Row to the Pole” with a crew of the following brave men: Mark Delstanche, Billy Gammon, Rob Sleep, David Mans, and Mark Beaumont, the latter a cameraman who is going to make a documentary about this expedition. This is the first attempt ever for someone to try to row to the magnetic North Pole. The expedition, which got its name from the official partner and sponsor, Old Pulteney Single Malt Whisky, left Resolute Bay in Canada on 29 July. Read more about this interesting rowing trip by clicking here. The filming of Bert and Dickie has started. 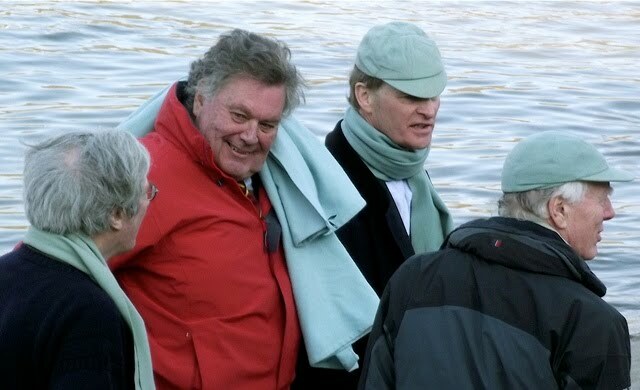 Yesterday, the Daily Mail showed photographs of Bert and Dickie, well, the actors playing them, Matt Smith (Bert Bushnell) and Sam Hoare (Dickie Burnell) out on the water. It looked a little cold, I think. The journalist that wrote the article, Georgina Littlejohn - is she aware that an ancestor of hers, Charles William Littlejohn, rowed in two winning Oxford crews in the Boat Race in 1911 and 1912, and took an Olympic silver medal in the eights in Stockholm in 1912? - has obviously been reading HTBS! Some of the things that I wrote was 'recycled' in her article, for example what Sue Bushnell, Bert's daughter, told the HTBS's readers the other day. Not any new information about the film in Ms. Littlejohn's article, but very interesting photographs! Just look how similar Matt Smith is to Bert Bushnell! Read/look at the Daily Mail's article here. 12 August, Bert and Dickie - Take Two! There has also been a lot of 'activities' around the other posts about Bert Bushnell, who died in January 2010. And that is nice, that is what HTBS is here for, to educate and entertain! Despite what we rowers believe, Henley is not only the Henley Royal Regatta. The town also has its Henley Literary Festival in the early autumn, this year between 28 September and 2 October. The organisers even have some ‘festival extra’ on Monday 10 October when Sir Steven Redgrave is to launch his new book about some Olympic highlights at the Kenton Theatre on New Street in Henley. Mind you, though, the ‘Olympic highlights’ are not Sir Steven’s own, it is a collection of other athletes’ performances, those of for example Jesse Owens, Sebastian Coe, Steve Ovett, Nadia Comeneci, Mark Spitz, Fanny Blankers-Koen, Bob Beamon, Ed Moses, Michael Johnson, Eric Liddell, Daley Thompson, Chris Boardman, Cassius Clay, and Kelly Holmes. Included are also stories of athletes who never took any Olympic medals, but won the hearts of millions of spectators, Eric the Eagle and the Jamaican bobsleigh team to mention a few. Also some of the ill-famed moments in Olympic history are included in Sir Steven’s Great Olympic Moments, like Black Power in 1968, the Munich massacre of 1972, and Mary Decker Slaney’s clash with Zola Budd in 1984. Tickets for the Festival can be bought from the box office at the River and Rowing Museum (Monday to Friday, 10 a.m.-4:30 p.m.) or by calling 0118 972 4700. 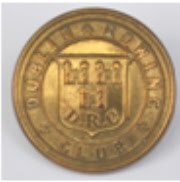 Dublin Rowing Club existed between 1906 and 1942. Here follows part 2 of the story of the club, written by Greg Denieffe. Part 1 was posted yesterday. “The year was 1942, the time April/May and I was standing close to the river by the hedge separating Dublin Rowing Club from Neptune. Joe Boylan approached me and asked if I would cross to the main door of Neptune, knock, and ask if I would oblige Joe by selling him a bottle of Guinness. I believe the bottle cost 6½ old pence. The occasion is important to me because it marked the first time I ever set foot in Neptune; the idea of having to ask for an obligement must appear strange to our members today. Then the hedges around the club houses marked the boundary of each. 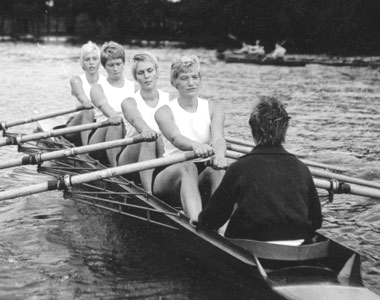 By May that year Dublin Rowing Club was in trouble; the maiden four in which I was a crew member broke up. However their senior four finished the season before the club closed its doors. Eric Foster and I joined Neptune but too late to gain a place in their maiden crews. We were in time to see them win the Blue Riband of Irish rowing on our own doorstep at Islandbridge. Des O’Sullivan and Bill Frazer followed us into Neptune in 1943.” 3. Wally Stevens went on to become president of the Irish Amateur Rowing Union and Dessie O’Sullivan president of the Olympic Council of Ireland. The senior four did finish the season and whilst not winning any silverware they did have an eventful race at Boyne Regatta. In one of the heats the boat of their opponents, Belfast Commercial, filled with water on the way to the start. They vacated, emptied and reoccupied in shallow water before losing to Dublin. 4. In reality it was Dublin Rowing Club that was sinking. There were discussions with Commercial Rowing Club and even suggestions that they might merge. But Commercial Rowing Club would have nothing to do with a merger and when Dublin Rowing Club finally closed, Commercial Rowing Club like a hermit crab took over their premises at Islandbridge leaving Dolphin Rowing Club alone in Ringsend and sadly, they like Dublin Rowing Club went out of business that year. 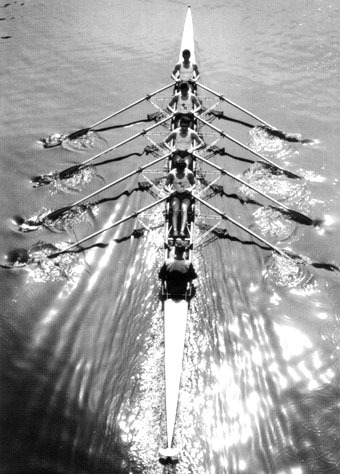 University College Dublin Rowing Club was founded in 1917 and become lodgers of Commercial Rowing Club, Ringsend. In 1919 UCD Rowing Club moved in with Dolphin Rowing Club, Ringsend. In 1926 they changed their name to University College Dublin Boat Club and in 1928 moved upstream to Islandbridge and became lodgers of Dublin Rowing Club where they stayed until their own boat house was completed in 1932. 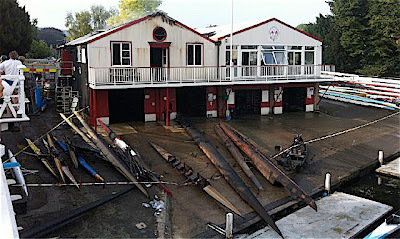 Commercial Rowing Club occupied the premises from 1942 until New Years Eve 1992 when vandals broke in and set fire to it, burning it to the ground. Dublin Rowing Club and their former boathouse were no more. The original picture purchased on eBay. Not in great condition but well worth preserving. The Club colours were dark and light blue. 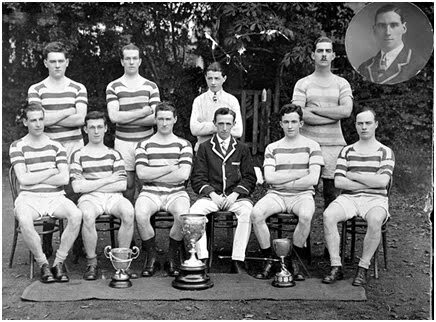 Included in the picture are F.J. Kelly (back row 2nd left), Irish Champion sculler 1930, 1931 and 1932 and Joseph P. West (front row far right) who was vice-president in 1932 and 1932 and president in 1934, 1935 and 1936 of the Irish Amateur Rowing Union. The following photograph appeared in the Irish Independent newspaper in 1924. 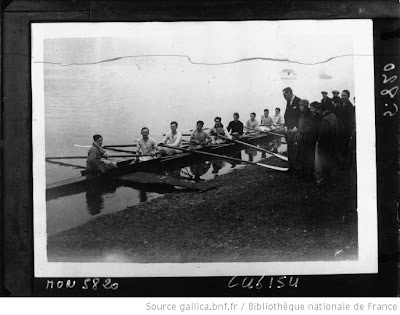 It is described in the National Photographic Record of the National Library of Ireland as “Ireland Soccer Team v. U.S.A.” I believe it is of a group of rowing men outside the Dublin Rowing Club at the 1924 Tailteann Games Regatta. The dark jackets with light trim appear to be those of Dublin Rowing Club. 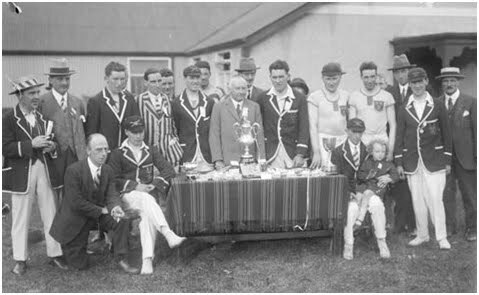 The person with the child on his lap is probably B. Harrington, coxswain of the 1921 junior eight. I think I have also identified two others from that crew: K.O’Reilly (3rd left, standing) and B.O’Reilly (10th left, standing) both wearing Dublin Rowing Club jackets. I am however open to correction. 1. T. F. Hall, History of Boat-Racing in Ireland (1939). 2. T. H. Nally, The Aonac Tailteann and the Tailteann games: their origin, history, and ancient associations (1922). 3. W. J. Stevens, ‘Neptune, as I remember it’, from Neptune Rowing Club 1908-1983 (1983). 4. W. F. Mitchell, Belfast Rowing Club, 1880-1982 (1994). Greg Denieffe, who has a special interest in Irish rowing, has sent a nice piece about the Dublin R.C to HTBS. Greg's article is in two parts, the second part will be published tomorrow. Enjoy! The Dublin Rowing Club was established at Chapelizod in 1906. The first appearance of the new club was at Boyne regatta where they competed for the Cairnes, Maiden and Kelly Cups. Their first boathouse was a primitive shelter on the bank of the river, but in 1907 a suitable site was secured and the present clubhouse erected. (It was opened the following year, 1908). 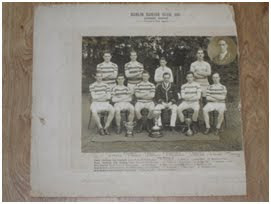 In 1907 the Dublin R.C. won its first trophy, the Corporation Cup at Boyne. 1. The site of the new clubhouse was a few miles downstream in Islandbridge on the opposite side to the Dublin University boathouse. Neptune Rowing Club which was established in 1908 built their clubhouse next door and for now rowing in Dublin was split between the clubs that remained in Ringsend (Commercial Rowing Club and Dolphin Rowing Club) and those at Islandbridge. 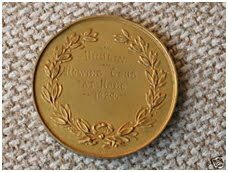 They won the Corporation Cup for under-age fours again in 1909 and in 1910 they had a fine junior four that won the Boyne Cup and numerous other cups at smaller regattas. At the Boyne regatta of 1913 Dublin won both the maiden eights (Aspirants Cup) and maiden fours (Visitors’ Cup). The future must have looked promising for Dublin but it would be seven years before they would celebrate another victory. The political situation in Ireland was worsening. In Dublin there was the general strike and lock out of 1913 and the onset of the First World War saw an end to almost all rowing from the end of the 1914 season until the spring of 1919. The Easter Rising of 1916 left the city devastated. The general election of 1918 was quickly followed by the War of Independence between January 1919 and July 1921. The Anglo Irish Treaty of December 1921 gave rise to Civil War which did not end until May 1923, and yet Dublin Rowing Club survived. The picture below is of the group of men who saved the club. Dublin Rowing Club, 1921, Junior Eight, Winners at Bray Regatta: B. O’Reilly (4), F. Kelly (7), L. Richardson (Cox), L. Mooney (6), (inset) R. D. Moore, Sec. K. O’Reilly (3), P. Murphy (5), P. O’Reilly (2), B. Harrington (Cox), A. Brady (Bow), J. West (Stk). Also winners of: Boyne Challenge Cup, Drogheda - Junior Four, Roche Challenge Cup, Dundalk - Junior Four, Bray Regatta – 2nd Senior Four, Junior Four & Junior Pairs (coxed). This group began rowing in 1920 and repeated the club’s wins of 1913 at Boyne regatta winning the maiden eights and fours. These wins upgraded the crew to junior for the following season and the photograph shows that they were successful at that grade and very proud of their win in the junior eights at Bray. I believe that their victory in the junior fours at Boyne would top that. It is interesting to see that they also won at Dundalk. 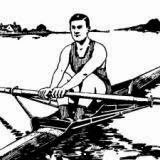 Although there was rowing in Ireland in 1921 & 1922 many regattas were not held owing to the continuing troubles. In fact Dundalk Rowing Club’s boathouse was maliciously burnt down in 1922. Dublin Rowing Club now had a group of senior rowers for the 1922 season. Dublin Metropolitan Regatta was a victim of the Civil War but the Dublin clubs were determined to hold a regatta that year and held a “Metropolitan River Carnival” at Islandbridge late in the season. Dublin Rowing Club won both the senior eights and fours on their home water. Their journey from maidens to seniors was complete and they also helped save the Irish Senior Eights Championship that year. It was raced at Trinity Regatta on the 17 June, the first since 1914 and there were only two entries, Dublin University Boat Club winning by three lengths. 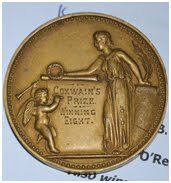 A medal inscribed on the reverse “Dublin Rowing Club, ‘At Home’ 1924”. 45cm in diameter. A blazer Button showing the crest of Dublin Rowing Club. 20cm in diameter. Over the next twenty years Dublin Rowing Club had successful years followed by several barren ones. In 1923 their new maiden eight won at both Boyne and Trinity regattas. In 1928 they won junior and senior sculls at Galway. The period 1930 to 1933 was rather more successful. In 1930 F.J. Kelly won the Eblana Challenge Cup for senior sculls at Dublin Metropolitan Regatta which was long regarded as the Irish Sculling Championship. He repeated this feat in each of the following two years adding the senior sculls at Galway in 1931 and the senior sculls at Galway and Trinity regattas in 1932, making him undoubtedly the best sculler in Ireland at that time. The 1932 season was the most successful in the club’s short history. In addition to Kelly’s wins their under-age four won at Boyne and Dublin Metropolitan before winning the same event at The Tailteann Games, beating Queen’s University Belfast by ½ a length. Their junior sculler J.P. Finn won at Trinity, Galway and also at The Tailteann Games where he beat Lady Elizabeth B.C. by four lengths in the semi final and beat Newry by three lengths in the final. This was the third and final Tailteann Games since their revival and the regatta was held on the Boyne in Drogheda. The 1924 and 1928 Tailteann Games regattas were held in Dublin and Cork respectively. The ‘Aonac Tailteann’ [literally translated as ‘Tailteann Fair’] were an ancient games held in Ireland, instituted in 1829 BC to commemorate the death of Queen Tailte. It is not generally known, and will, no doubt, surprise many of our otherwise enlightened readers to learn that the far-famed Olympic Games of Ancient Greece drew their inspiration from the still much more ancient games in Ireland. The Hellenic games may, indeed, be traced almost directly to the great national celebrations of Tailteann.2. The games ran until 1171 AD when they died out after the Norman invasion. Following Independence in 1921 there was a great interest in reviving the games and they were held again in 1924, 1928 and 1932. In the rowing section there was international competition in 1924 and 1928. 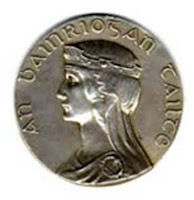 A short article on the Tailteann Games 1924-1932 can be found here; and here is a link to a British Pathe newsreel with a rowing interest from the 1924 Games. 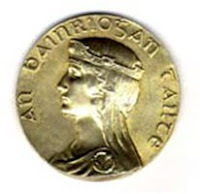 Gold [silver gilt] and Silver medals for rowing from the 1932 Tailteann Games Regatta – the reverse inscribed Anonach Tailteann, Baile Atha Cliath, First/Second Prize, Rowing, with provincial crests surrounding the border, the obverse depicting a young Queen and inscribed An Bainrioghan Tailte. "Bert And Dickie" - Take Two! 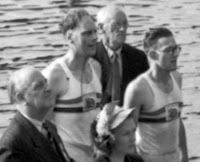 Two days ago, HTBS wrote about the BBC One 90-minute drama Bert and Dickie which is about the two oarsmen, Bert Bushnell and Richard ‘Dickie’ Burnell who became Olympic champions in the double sculls in 1948. Bert and Dickie is written by William Ivory and filming starts this month. While the actor Matt Smith is going to play Bert Bushnell, HTBS can now reveal that Dickie Burnell is going to be played by actor Sam Hoare (on the left), who with his 6'5" at least has the height to portray Burnell. 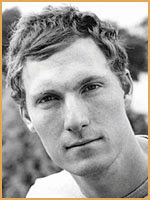 Hoare has been in movies like The Golden Compass and Captain America. You will find a list of his acting parts on television and in theatres by clicking here. I am keeping my fingers crossed that Smith and Hoare can do Bert and Dickie justice. With the Olympic Games coming up next summer in London, the British media is buzzing with stories from the Games in 1908 and 1948, which were also held in London, and the Olympic rowing in Henley-on-Thames. 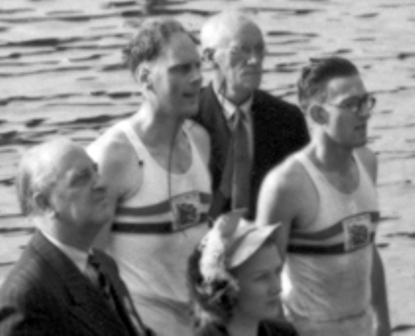 At the 1948 Olympic regatta, Great Britain took two gold medals in the coxless pairs with Ran Laurie and Jack Wilson, and in the double sculls with Dickie Burnell (on the left) and Bert Bushnell. HTBS has written several pieces about these two pairs, and we have also shown some good, old news reels with these fine oarsmen. If you have missed any of these entries or films, following are the links: Ran Laurie and Jack Wilson & Dickie Burnell and Bert Bushnell. For the upcoming Olympic year BBC One is working with 25 hours of drama that will somehow “connect with the hearts and lives of British people,” as Ben Stephenson, Controller of drama commissioning said in an interview the other week. He also stated that 2012 “will be a year of huge cultural significance”. As of this writing, only Matt Smith, who is staring in the British television series Doctor Who, has been picked to play Bert Bushnell, while nothing is known about who is going to portray Dickie Burnell. It is said that Smith once was a brilliant football player before he injured his back, but he knew nothing about rowing, so now he has to take lessons to learn how to scull. 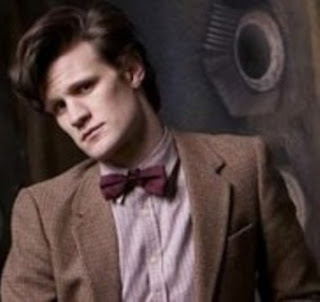 To read what the Daily Mail wrote about Matt Smith playing Bert Bushnell, click here. Filming Bert and Dickie is planned to begin in this month. HTBS has been in contact with Bert Bushnell’s daughters, who in an e-mail say that they “are delighted the story of Bushnell and Burnell's success at the 1948 Games will be told. The film will be a dramatisation of the Olympic story and the relationship between our father and Burnell, who had only teamed up a few weeks before winning Olympic gold in the double sculls”. They go on to say that, “Dramatisations of real events are sometimes a little loose with the facts in the interests of audience expectation, but in any event the film should be good entertainment, especially as it is to be broadcast just before the opening of the London Olympics". Of course, I am thrilled that there is going to be a film about these two great oarsmen. Hopefully, it will be shown here in the U.S., too. Nowadays, films on DVDs come out rather quickly after it has been televised. As soon as I hear more about the production, the information will be up on HTBS. Founded in 1997, the Gallica digital library from the National Library of France offers over a million documents accessible for free: Books, Manuscripts, Maps, Images, Newspapers, Magazines, Periodicals and more. Lovers of rowing history can browse the pages at http://gallica.bnf.fr/?&lang=EN for the English version. 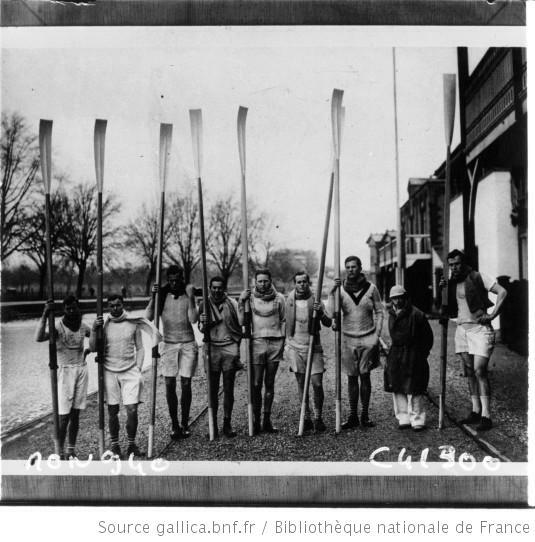 With keywords like “aviron” for French documents, or “rowing”, you will find many images and book references. There is detailed information as to the author and the date of publication. You can browse the topic, forward it through social networks, get a copy of a document is subject to conditions... Enjoy ! To get more information in English about this digital library, please click here. Picture on the left shows a Polish coxed four, 1932. This is an event-reminder about the next Rowing History Forum, which is going to be held at the River and Rowing Museum in Henley-on-Thames on Saturday, 29 October, between 9 a.m. and 5 p.m. Enjoy a day of talks on rowing history and a visit to the Museum’s new store, which has many rowing books to offer. Speakers include Guin Batten on women and the Olympics; Peter Mallory on the coaches behind two centuries of competition, Peter will also sell and sign copies of his 4-volume book The Sport of Rowing, which will be published in October; renowned collector Tom Weil will talk on his latest obsession; and Jerry Sutton will demonstrate the making of wooden oars. Plus, present rowing historians will report on their ‘work in progress’. Tickets: £50. To book, please call 01491 415600. Price includes morning and afternoon tea & coffee and a delicious buffet lunch. I like the colour pink. 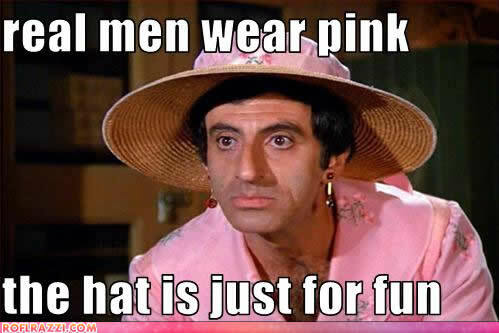 I sometimes wear a pink shirt, or a pink tie, and socks with a dash of pink. I know that some of you might think that it’s a really girlish colour. But, I would like to ask you then, how come some of the most prestigious rowing clubs in England are using pink as their club colour? The men of Leander Club, Auriol Kensington RC, Westminster School, and Abingdon School are all having pink on the oar blades, racing kits, etc. This question is brought up by the good ‘Doctor Rowing’ (Andy Anderson) in the current issue of the magazine Rowing News (September, 2011). There, you see, it’s blue that is the girlish colour! After 220km, 45 locks, and plenty of blisters, Stephen Feeney, Iain Weir, Mark Bavington, and James Clarke of the London RC have arrived at Putney. With their long ‘outing’ on the Thames, they have managed to raise almost £2,000 for the Neuroacanthocytosis Advocacy. Find out what HTBS wrote about their row on 28 June by clicking here. 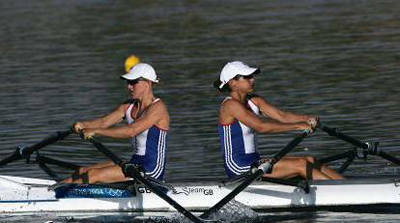 If you would like to read what British Rowing said about the event on their web site, click here. Hylton Cleaver is a name that pops up now and then on HTBS. 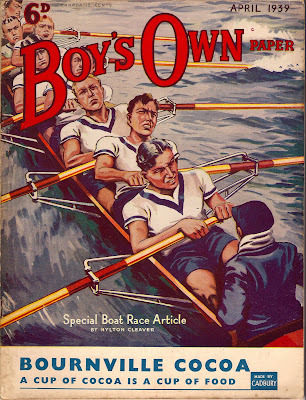 Yesterday in the mail, I received a copy of The Boy's Own Paper of April 1939, a magazine I had won on eBay. The main featured article is by Cleaver, "Coxing in the Boat Race - and What It Feels Like to Row In It". The article is 3-pages long and written in a typical Hylton Cleaver way: entertaining, educational, and with a comparison to at least one other sport, in this case, boxing and tennis. Cleaver writes, "What is true is that this Boat Race is not a strictly foregone fixture like the Derby or the Cup Tie; nor is there a fixed date for it and time of day. It is occasioned by a written challenge from the new President of last year's winners, and that challenge is answered, also in writing. otherwise there would be no race. There is no prize. The expense of the race is considerable, and is borne by the college boat clubs at the universities. nothing whatever comes from the public. That is why we watch it for nothing." 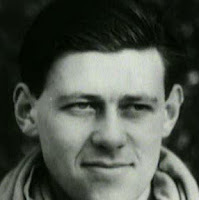 Next month, September 2011, it is exactly 50 years since Hylton Cleaver passed away. I think I will raise a glass to his memory! Following a fire at the club house in the early hours of Wednesday [3 August 2011], the job of clearing up and getting back on an even keel started in earnest last night. Club Chairman, Peter Hunt, praised the efforts of the local fire brigade who, at their peak, had fifty five team members tackling the blaze and rescuing as much of the contents as was safe to do. “Through their efforts much of the club equipment and memorabilia has been salvaged including the memorial to those members who made the ultimate sacrifice during World Wars One and Two”. Club Captain, Sally Reay has quickly made arrangements for rowing to restart with the first oarsmen due to take to the water on Friday morning ahead of the busy weekend sessions. Club members are keen to return to training with a key event of the summer looming: the local derby at Maidenhead due on Saturday 13th August. Sally had spent much of the Wednesday fielding calls of support from Marlow businesses and members of the rowing community for which the whole club is grateful. On Saturday club members will be on Marlow Green and on the High Street to both launch the campaign and reassure the town that the Rowers have returned. Club members and Olympians Katherine Grainger and Sarah Winckless express sadness in an interview in Bucks Free Press here. Read what British Rowing is writing here. A BBC report at 9.12 BST quotes Berkshire Fire and Rescue Service as saying that 55 firefighters and eight engines were called to the blaze at about 04:15 BST. Arson is not suspected at this stage. I have asked a rowing friend who lives in Marlow to find out more but judging from the picture by KatieJames45 on Twitter it looks like the fire started in the left of the building, perhaps in the bar/kitchen area. The other half of the upper floor, on the right, is the gym. The Bucks Free Press website report is here. Here are some photographs from My Marlow Blog. 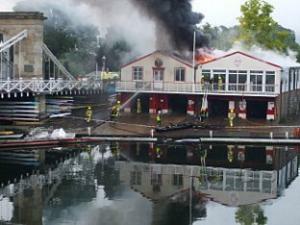 It is a very sad day and a reminder to all rowing clubs to review their fire precautions. HTBS will keep you updated when we have more information to share! The avid reader of HTBS cannot have missed that the whole entire 'staff' of HTBS visited the Henley Royal Regatta, HRR, this past June/July - and what a marvellous regatta it was. My dear friend Per Ekström, Editor-in-Chief of the Swedish rowing magazine, Svensk Rodd, and I went from Sweden to London, where we were met by fellow HTBS-in-arms, Hélène Rémond and Tim Koch. Tim proved to be an excellent host and all four of us visited his club, Auriol Kensington RC, located by Hammersmith Bridge, on the evening of our arrival. The following day, I had to swing by the British Rowing's office, but soon joined the others at Henley. Despite the around 40,000 visitors a day, Per and I managed to find an old friend of ours, Jan Servin, who was at the regatta with his daughter, Karin, who rows at one of the Universities in London. Don't ask me how but amazingly, HTBS reader and contributor, Greg Denieffe, managed to spot me on the towpath in the deep crowd of spectators, and it was very nice to chat with an HTBS fan, whom normally would be an Ocean away. Yesterday, I succeeded in adding a slide show of photographs from HRR, taken by Hélène, Tim, and Jan. For several days, the HTBS technician, Mrs. B., has tried to upload a HRR film by Tim, who shot and edited some moving pictures. Well, yesterday, she solved the problems, and therefore I am now pleased to be able to show Tim's HRR film here on HTBS. 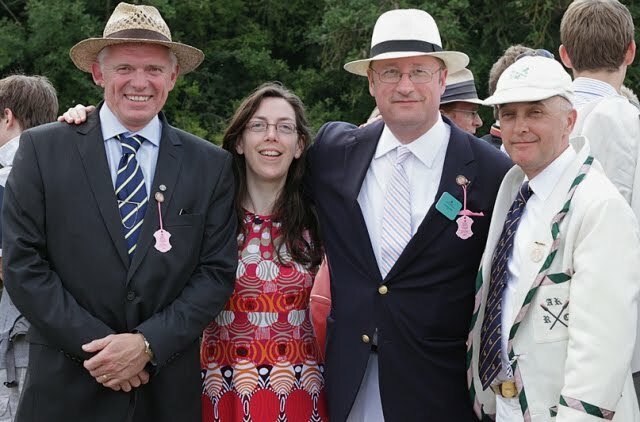 For those of you who know any Swedish, you might enjoy my article "Henley Betraktelse" about our visit at HRR which is posted on the Swedish Rowing Association's web site. Eventually, photographs from this year's HRR will be added to the article. Of course, with the Olympic Games coming up in London next year, the media is reflecting on different aspects of the Games held there in 1948 (but not so much on the 1908 Games, also held in London). At the 1948 Olympic rowing in Henley, Great Britain was represented in the eights by Cambridge, who had won The Boat Race that year. The Cambridge crew took an Olympic silver medal. Rarely, are sport historians interested in things that never happened, or, in the case of rowing historians, races that were never held. However, the HTBS readers might find the news reel above interesting as it shows an attempted by the Thames Tradesmen's Rowing Club to represent Britain in the eights at the Olympic rowing in 1948. Anyone interested in professional rowing, famous World Champion sculler, Bert Barry, who was their coach, appears in the film for a couple of seconds.